A Yorkshire Dales walk on the southern edge of the National Park. 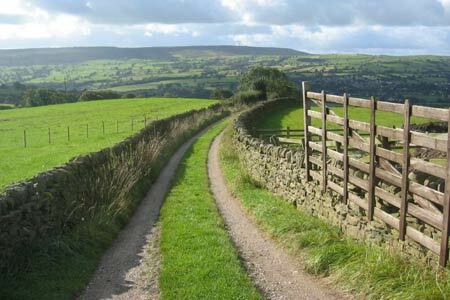 Starting from Addingham, the route continues to Beamsley Beacon and onto Bolton Abbey. Rolling pastureland, wild moorland, riverscapes and historic buildings are all included in this interesting walk. It is recommended you take a map. The preferred scale is 1:25k. Digital Maps - For more information on digital maps go to Anquet Maps. Digital maps, including Ordnance Survey, Harvey Superwalker and British Mountain Maps, are available for your PC, Mac, iPhone, iPad, Android tablet and phone. Note : The distances quoted to other walks in the vicinity are measured in a straight line. The distance by road may be further. Guidebook to 50 of Jack Keighleys favourite walks in the Yorkshire Dales. All the walks are circular, and range from 4.5 to nearly 8 miles. They vary from simple valley strolls (ideal as half-day 'family rambles') to strenuous fell expeditions. Hand-written and profusely illustrated in Jack's highly distinctive style. Walk grading - Learn how each walk is assessed and select a walk to suit your ability and experience by going to Walk Grading Details. Follow Walking Britain for the latest news. Lightweight, stylish and lightweight alternative to traditional waterproofs ideal for walkers. More info. Stay safe on the mountains. Use the Met Office specialist reports or their iOS or Android Apps (here & here) which offer detailed forecasts for most mountain areas in the United Kingdom. Click for a simple guide of how to start walking. Includes a guide on how to select your walks. Copyright © 1997 - 2017 Walking Britain. All rights reserved. Please ask permission to use site content and images.